Wow. I am so ready for a sunny jolt of bright-coloured life right about now. Mother Nature has been alternating between gray drab dreary-ness and blistering icy freezing-ness. Take your pick. So when I popped into the grocery store and a huge display with buckets of tulips stood right inside the entrance…. Well, to say they were calling my name would be an understatement. Rays of warm sunny-ness for four bucks. Three bundles for ten. Sold. My favourites are always the ones with a hint of variegation. 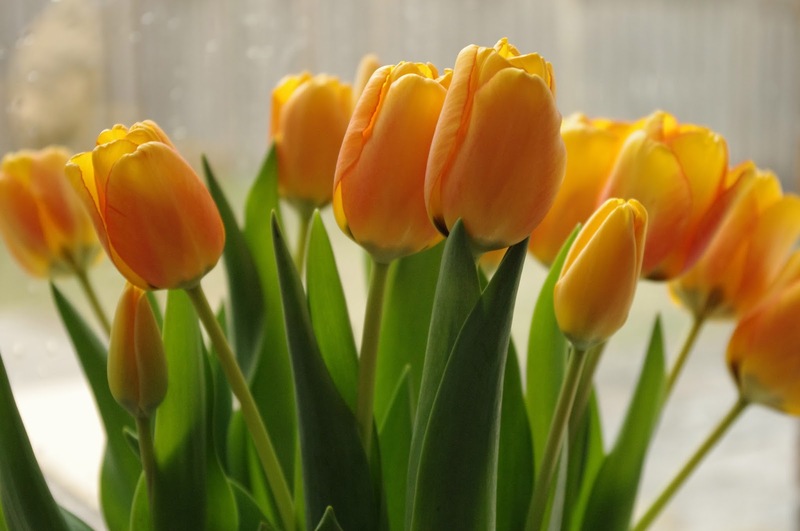 These yellow ones with a tinge of dark orange at the edges of the petals were the winners. The first is to to trim the bottom bit from each stem. And you might notice the bottom of the stem was split open a bit. 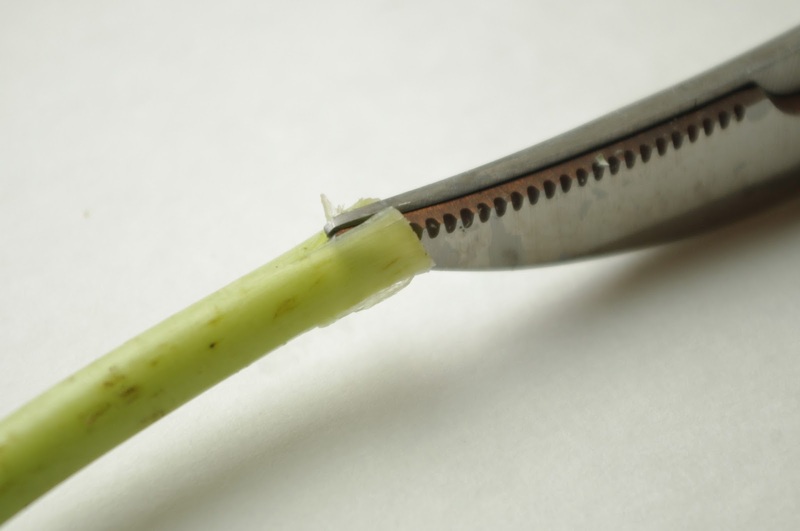 So you want to cut a new slit into the end of each stem like so. This I learned from Steven Sabados on the TV show Steven and Chris. Have loved that guy ever since he started out on Cityline back in the day. He’s a smart one with good taste and do-able design projects. But I digress. I think the idea behind this trick is to help the stem soak up as much water as it can and keep the bloom fresh. 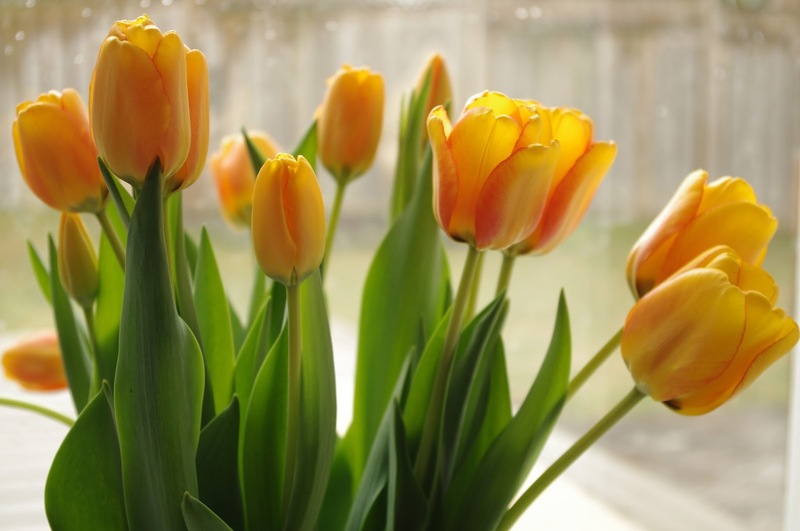 You know how cut tulips can quickly droop right over as soon as you get them arranged in your vase? 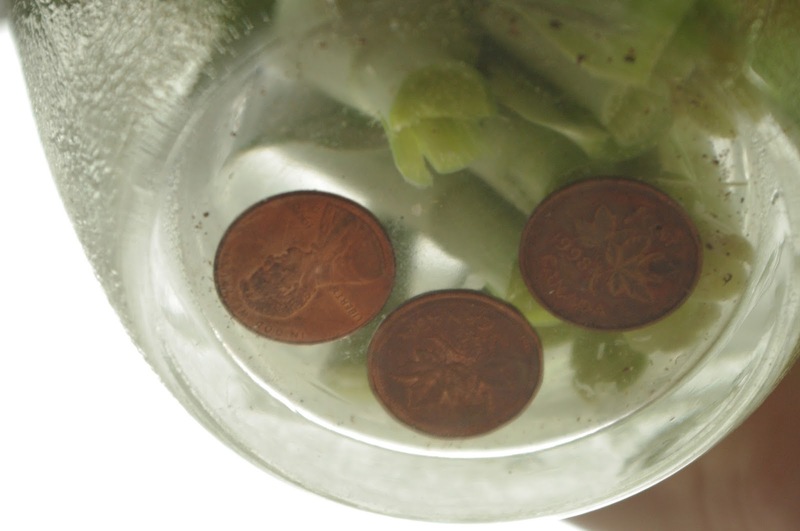 The second trick is to drop some tarnished pennies into the bottom of your vase. It helps to keep the stems straight for a longer time. Don’t remember where I picked up this little tip. But it works. And when it’s time to pitch out the flowers, you’ll be left with some super-shiny pennies! I’m sure it’s very scientific. Sometimes the drooped over flowers can be artsy looking. Sometimes it just looks sad though, when all you wanted was some fresh flowers on the kitchen counter. Which is what I have now…some rays of sunny freshness. For a few dollars. From the local grocery store. To get me through the next little while of alternating dreary-ness and freezing-ness. Why don’t you get some too?